One of the reasons I especially enjoy research with handwritten letters is being able to see the little things that reproduced transcriptions often omit. The excerpt, above, is from the bottom corner of a letter than Alexander Hamilton wrote to Victor Marie du Pont de Nemours in May, 1804. Most of the letter concerns the repayment of a debt, with a complicated explanation of the principal and the interest accrued. As dry as this may be, the letter has importance because of the two parties corresponding - the former Secretary of the U.S. Treasury writing to a prominent French-American diplomat and businessman. But it's the non-business part of the letter that intrigued me. Aside from the fact that I wish I could end letters with Hamilton's grandiloquent yet breezy closing sentence ("The multiplicity of my affairs will excuse my delay in completing this business"), it's that little postscript to the left that caught my eye. "P.S. I sent you some days since a note requesting you to meet Mr. Bonaparte at my house on Sunday three oClock to dine. I hope to have the pleasure of seeing you." Yes, Hamilton is displaying his typical impatience because Du Pont hadn't responded to his first invitation, but he's also describing what must have been quite a grand dinner. Mr. Bonaparte was Jérôme Bonaparte, the youngest brother of Napoleon Bonaparte, First Consul of France (and soon to become Emperor.) While visiting America, the nineteen-year-old Jérôme had fallen in love with Elizabeth "Betsey" Patterson of Baltimore and had married her. An American merchant's daughter did not fit into Napoleon's dynastic plans, however, and the First Consul had already made his displeasure known. But in May of 1804, Jérôme and Betsey were glamorous newlyweds, and having them as guests must have been a social coup. In addition to the French-born Du Pont, the guest list included Hamilton's good friend, statesman and bon vivant Gouverneur Morris, who had served as the American Minister Plenipotentiary to France. Considering that Hamilton also spoke French fluently, it's easy to imagine French - the language of 18thc diplomacy and worldly sophistication - as the language of choice during the meal. Several days after this letter, Hamilton wrote a quick note to his wife, Eliza Schuyler Hamilton, to let her know that "On Sunday Bonaparte & wife...with dine with you. We shall be 16 in number...." Because this note is undated, it's impossible to tell exactly how much warning Hamilton gave Eliza before the dinner. At this time, he had his law office in what is now lower Manhattan, and often remained there overnight instead of making the long trek (which could take a couple of hours, depending on the weather) by horse or carriage to the family's country house, The Grange, in the then-rural northern part of Manhattan. Eliza and the couple's younger children were living at The Grange, which would have been site of the dinner. In the same note, Hamilton asks Eliza to send the "coachee" to town on Saturday - perhaps he intended to provide transportation for at least some of his guests - and the "waggon", probably for more provisions for the meal. He also says that it was "my intention to get out Gentis and perhaps Contoix"; Gentis had been employed by the Hamiltons as a cook, and Contoix had also worked for the family. Clearly Hamilton was planning an impressive dinner. Now Eliza was an accomplished hostess, and I'm betting that none of this fazed her. She would have handled French guests, extra servants, and an elegant meal with gracious aplomb. 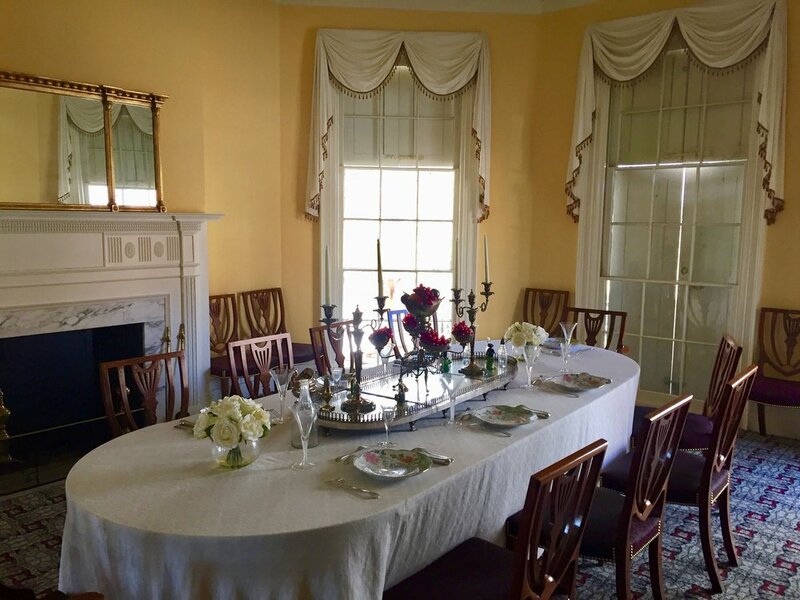 While sixteen guests could have been a tight fit in The Grange's dining room, right, the accommodating design of the house would have let her open the doors into the parlor and add another leaf or two to the table. I can also imagine Hamilton himself fussing over every detail of his dinner from the menu to the wines, and sparing no expense, either. With the tall windows open to catch the breezes from the river, it must have been a merry and pleasurable evening indeed. But the hindsight of history casts an undeniable shadow over this luxurious little dinner. A little over a year later, the marriage of Betsey and Jérôme Bonaparte would be annulled by Napoleon. Betsey would eventually return alone to America with their infant son, while Jérôme would marry the German princess his brother had chosen. At the time of this dinner, Hamilton had already begun exchanging barbs with another New York lawyer, a conflict that would fester and escalate throughout the spring and early summer. This dinner took place on May 13, 1804. Almost exactly two months later, on July 12, Alexander Hamilton would die of wounds suffered in his duel with Aaron Burr. Thanks to Lucas R. Clawson, reference archivist & Hagley historian, Hagley Museum & Library, for sharing this letter with me. Above: : Dining room at The Grange, New York, NY. Photo ©2017 Susan Holloway Scott. Below: Detail of a letter from Alexander Hamilton to Victor Marie du Pont de Nemours, May 1804; collection of Winterthur Museum. Read more about Eliza and Alexander Hamilton in my latest historical novel I, Eliza Hamilton, now available everywhere.